We want to keep that energy high throughout the playoffs, by offering the best fan experience during the #WPGWhiteout Street Parties presented by Tim Hortons. This website has all the information and resources you need to make your #WPGWhiteout Street Parties presented by Tim Hortons experience safe and enjoyable. Tickets are $5 each, with 100% of the proceeds being administered through United Way of Winnipeg. These funds will be invested into our city. For more details, click here. Can I leave the Street Parties and come back in? No. The Street Parties are a no re-entry venue. If you need to leave for any reason, you will not be allowed back in. 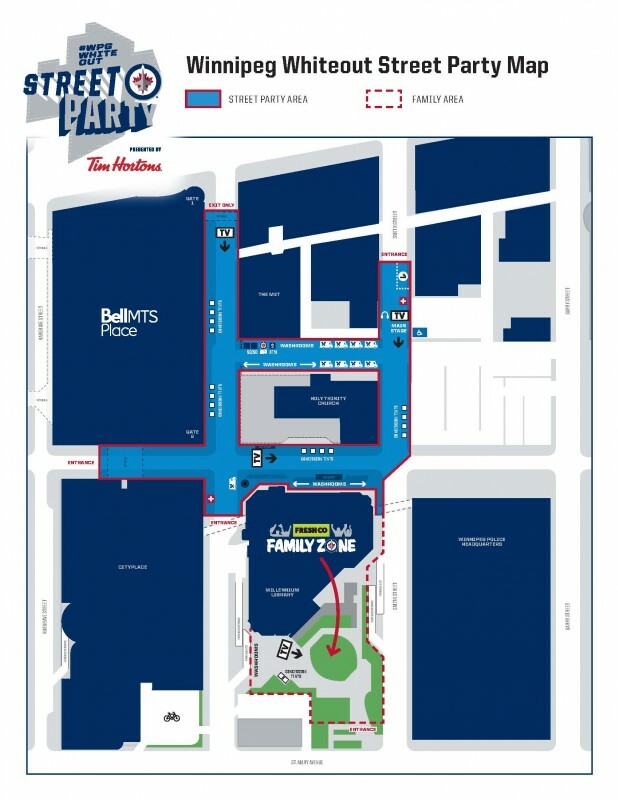 Once game patrons have scanned their ticket into Bell MTS Place, they will only be allowed to re-enter the Street Party if capacity permits. Will we be able to watch the game live at the Street Parties? Yes! The Street Parties will have multiple screens to watch the game live, set up at strategic points throughout the premises. This includes a screen in the family zone at Millennium Library Park. You won’t miss a single second of the action. Yes. There will be some food trucks at the Street Parties so you can grab a bite before and during the game.